I’m always looking for healthy breakfast alternatives. Most American breakfast foods are laden with fat, sugar and refined carbs, and oatmeal with fruit gets a little old after a while. Avocado toast is a quick, healthy breakfast that uses fresh ingredients. There are a lot of variations and it’s easy to come up with your own. This is one that turned out particularly well and is easy to make. Enjoy! Chop the jalapeno and add to the avocado and mash with a fork. Add salt, pepper, garlic powder and fresh-squeezed lime juice to taste. Spray the bread with a bit of olive oil, and top with a layer of baby arugula. 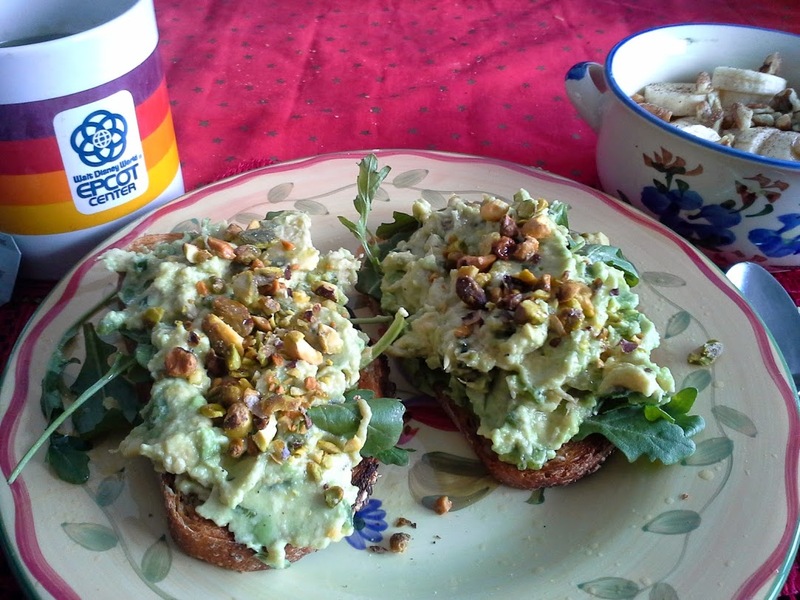 Spread 1/4 of the avocado mixture mixture on each of the toasts and top with the chopped pistachios. Finish with a spritz of olive oil.